Patmos Island, Dodecannese Islands, Greece travel guide. Greece holiday packages. Greece vacation. 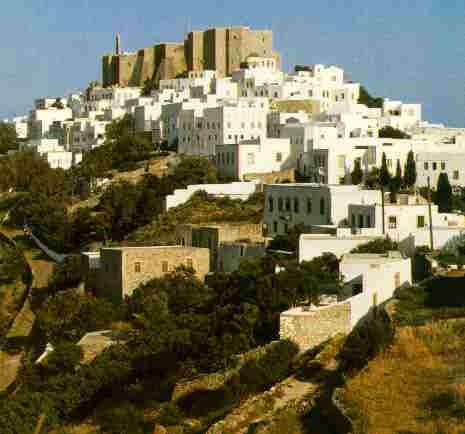 Patmos lies at the north western extremity of the Dodecanese, between lcaria and Leros. It has an area of 34 sq. km., a coastline of 63 km., and population of 2,500. It is 163 miles from Piraeus, and the first stop for the ferries going to Rhodes. Patmos can be reached by ferry from Piraeus, the islands of the northern and eastern Aegean, Kavala, the Cyclades, Rhodes, Kos and other islands of the Dodecanese. The Cave of the Revelation: The Cave lies halfway between Skala and Chora (4,5 km.). It takes the form of a 17th century monastery which was built around the cave where St John lived for two years (95-97 AD) and wrote the Apocalypse, dictating it to his disciple Prochoros. Next to the Cave is the church of St Anne, built by the Blessed Christodoulos. Chora: The vast Monastery of St John dominates it as a dark mass on the top of the hill, surrounded by two and three-storey houses, most of them are neo-Classical style.